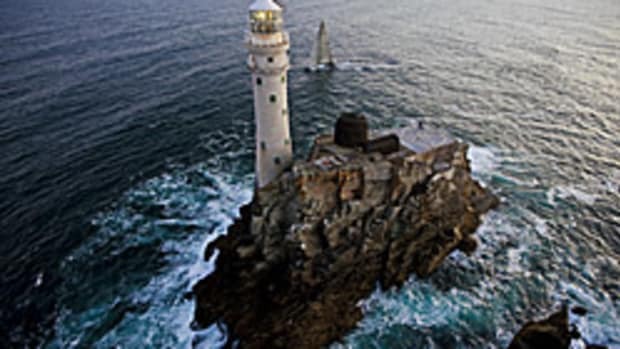 The day after a new multihull speed record fell in Britain’s fabled Rolex Fastnet Race, a new monohull record followed. The French trimaran Maxi Banque Populaire, a 140-foot trimaran skippered by Loick Peyron, set a new record for a multihull vessel with line honors in the Rolex Fastnet Race, reaching Plymouth in southwest England in a time of one day, eight hours, 48 minutes and 46 seconds at an average speed of 18.5 knots. That time smashed the previous record, set by the much-smaller 60-foot trimaran Fujicolour in 1999, by seven hours and 48 minutes. The next day, Tuesday, the monohull record was also demolished. Surprisingly the new record went not to Mike Slade’s 100-foot supermaxi ICAP Leopard, which had established the record of 1 day, 20 hours, and 18 minutes in 2007, but the smaller Volvo Open 70 Abu Dhabi, skippered by double Olympic silver medalist, Ian Walker. The black-hulled VO70 arrived at Plymouth on an overcast and drizzly, just under 5 minutes ahead of Franck Cammas’ VO70 Groupama 4 (FRA). In doing so she broke ICAP Leopard’s 2007 record by 1 hour 39 minutes. Click here for the official results.